We will never know a fraction as much about wine as Jens Strecker and Julie Howe, owners of Portalis. But with them around, we don't have to! Without a hint of the pretentiousness sometimes associated with fine wine, they guide customers to the right choice with the value of wine an important concept. Portalis offers a wide range of prices and styles and more than 400 wines from around the world in the retail shop, and 30 rotating wines available by the glass in the wine bar. 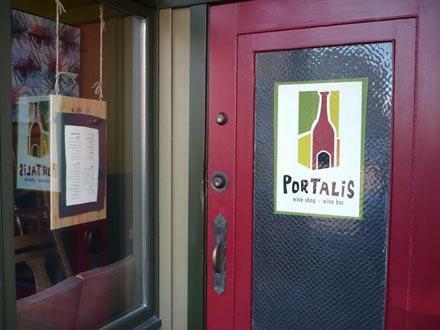 Last year, Portalis moved down Ballard Avenue a few blocks east of its original location. The larger shop maintains the same warm feeling as the original location. Exposed "Old Ballard" brick walls and flickering candles create a comfortable backdrop for the wine shop and the wine bar/restaurant that share the space. Customers talk quietly here, adding to the understated European ambiance and feel. Wine is, of course, on center stage, and is appealingly displayed on wooden racks. The racks are buffered by walls and space on all sides, giving the wine area a protected, vault-like aura. Sitting here is like being in a museum, next to valuable works of art. Strecker has great tips on matching wines with turkey, and offers them in a characteristically friendly manner. Being upsold is one of our least favorite activities, and Strecker and Howe provide unintimidating guidance. Suggestions are clearly based on their assessment of customer needs and tastes. While the space is set up as a showroom for the wine, overlooking the food would be a mistake. The menu nicely compliments the wine, featuring weekly wine and food pairings. On Wednesdays, bottles purchased in the retail shop can be enjoyed in the wine bar, with no corkage fee. Tuesday brings a happy hour special, with the second glass of wine half-priced. And during the Sunday Ballard Farmers Market, wine tastings at Portalis are free, making it easy to stop by and check out a new vintage. The limited menu offers value, flavor and versatility, with choices appropriate for a quick snack or a longer meal. We found comfort from the chilly outdoor temperatures with the satisfying, richly braised oxtails with horseradish mashed potatoes ($14). The Alois Lageder Pinot Noir ($22 a bottle) and purchased in the wine shop as part of our Thanksgiving Wine package provided well-matched company to the oxtails. A layered radicchio, endive and butter lettuce salad ($9), is enough for two to share and brings a welcome crunch to the meal. The unusual presentation of the layered greens offers a nice break from the more common "mix it up and throw a tomato on top" technique, and provides adventurous twists and turns as the lower layers are penetrated, revealing a foundation of raisins and pine nuts. A charming little hand crafted pizza with spinach, caramelized onion, bacon and blue cheese ($9.50) works wonders. This pizza is milder than expected based on the description, and the western-style bacon is chewier yet less overpowering than pancetta or other euro-cured meats. Oregon Blue also stays a notch or two below the super-funky flavor level of many other blues, allowing the fresh spinach to lead the way. This pint-sized, crisp crusted Italian-style pizza made friends quickly at our table. But the stars of this menu are the appetizers. Crostini with smoked trout and white bean puree ($7.50) comes arranged like a flower blossom. Toasted to perfection, the crisp slices contrast with the creamy, smoky spread, garnished with decorative but oh-so-functional fresh dill. The cheese plate (2 or 4 cheeses, $9.25 -$14.50), is served with fresh baguette slices, a little pile of candied walnuts, and dainty slices of green apple. While beautiful to look at, it also provides a marvelously balanced palate of taste sensations no matter what order the bites are taken in -- sheep cheese, walnuts, apples, blue cheese, apple, walnuts -- the possibilities are many. We wrestled over the last bite, causing a bit of a stir with cries of "hey, that's mine!" Portalis is a place to buy a special bottle of wine for a friend's birthday, to pick up something inexpensive for a weekday dinner on the way home, to have lunch on the weekends or to relax on Wednesday nights. Learn about new wines on Sunday afternoons, or at the more formalized wine tastings announced via their email list. Also featured are rotating exhibitions by local artists, with Portalis participating in the monthly Second Saturday Ballard Art Walk. Portalis is yet another reward for living in Ballard, and offers a real and sincere drinking and dining experience designed for both the old Ballard crowd and our condo newcomers.